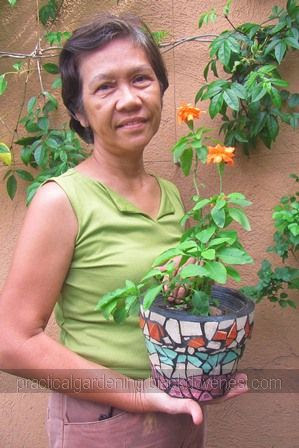 This Mosaic Flower Pot project was actually borne out of a class assignment that my son had in school. The class assignment was to come up with a mosaic project using broken tiles. The base for the mosaic was really optional, but it seemed all the students chose the terracotta or garden clay pot as the base to mount the mosaic design. So I helped my son start off with the Mosaic Flower Pot project by choosing the tiles and then helping him work on the application of sealant and grout until the mosaic flower pot was completed. You can go around the neighborhood and watch out for construction areas. There may be some ceramic tiles being dug up or torn down from old properties. Your best bet though is to go to ceramic tile supply centers. There would be plenty of ceramic tiles that may have been broken due to handling or delivery. They're practically new (just broken!) and there are plenty of colors and patterns to choose from. Remember, dark color tiles will look good with a light colored grout and vice-versa. Color contrast between tile and grout is key. 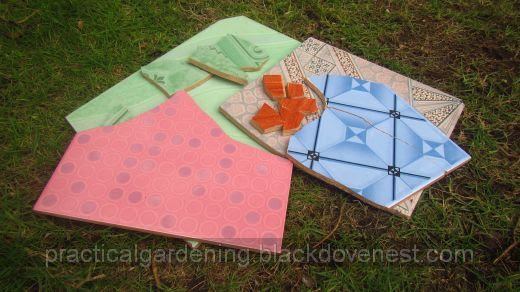 Ceramic tiles that are thick are harder to break, shape and position on the garden clay pot. They will also make the finished pot a bit heavier. Choose the thinner tiles if you have the option. 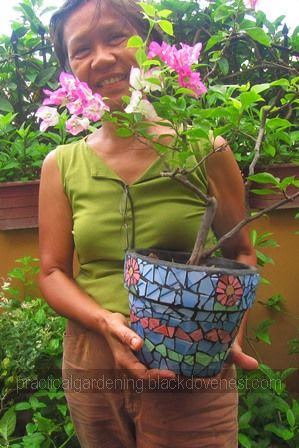 The bigger the garden clay pot, the bigger the surface to cover with the ceramic tile pieces. That means either bigger tile pieces will be used or a bigger quantity of small pieces will be used. Big tile pieces are more difficult to handle in decorating the pot. Smaller pieces are easier to handle but it will take a longer time to work on a comparatively bigger pot. Garden clay pots typically have drain holes. The smaller pots have the drain holes at the bottom center of the pot. The bigger pots have their drain holes about an inch above the bottom and at the side of the pot. You don't need to put tiles at the bottom of the pot so drain holes at the bottom of small pots are not an issue. However, for the bigger pots with the drain hole at the side, you may need to keep the drain hole open and not cover it up with tile or grout. The garden clay pot need not be necessarily new, but it needs to be clean and dry. So wash and scrub thoroughly any old but still usable garden pot and let it dry before working on it. You could actually use tile adhesive for the project of this purpose. But since we still had unused sealant at home, we just thought of using that. You do need to have a caulking gun to release the sealant's contents. The purpose of the sealant in this project is to position the broken ceramic tile pieces on the side surface of the garden clay pot. There will be spaces or crevices when all tile pieces are glued. These spaces will be filled with grout that will keep the tile pieces immovable and permanently fixed.